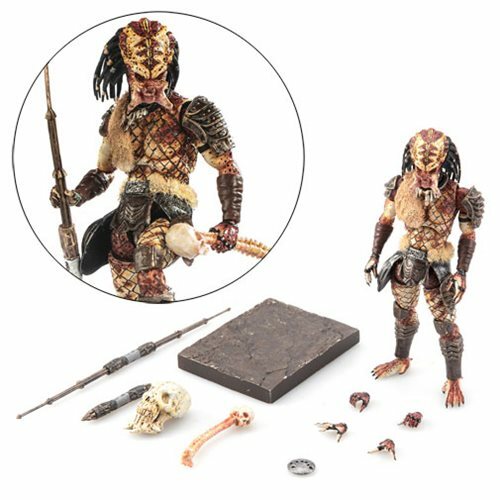 The Predator Shadow-Snake Predator 1:18 Scale Action Figure is based off of Predator 2, where the hunt took place in Los Angeles. Even on the streets of the City of Angels, the Predator stalks his prey with deadly precision. This Predator Shadow-Snake Predator 1:18 Scale Action Figure - Previews Exclusive features full articulation and stands approximately 4 1/2-inches tall. This Shadow-Snake Predator figure comes with staff accessories, skull, spine, interchangeable hands, and a stand for easy posing and display.